When it comes to cosmetic procedures and products, working out whether they’re vegan or not can be more complicated than you’d first think. With over 7% of the UK population calling themselves vegan now, some of these people will want to engage in cosmetic procedures, so it is important to know the facts. Even if you aren’t vegan, there is a growing number of us searching out cruelty-free products and cosmetic treatments that don’t include animal ingredients, or are involved in animal testing. This blog will be useful for you too. Firstly – The ingredients of the actual product. For a product to be vegan, it must contain no animal products and no ingredients derived from animals. Secondly – How the product was formulated and developed. If the product was not tested on animals it is considered to be ‘cruelty-free’ and this is then classed as truly Vegan. The actual product ‘Botox’ is Vegan friendly because it contains nothing of animal origin. Phew! HOW Botox is formulated however, is a different matter. Botox is considered and classified as a medicine (and must be prescribed like any other medication by a highly qualified medical professional) and therefore BY LAW has to be tested on animals before it can be used for humans, to ensure its safety and efficacy. ALL the medications which we could take, from the basic paracetamol to major immunity compromising medications, whether we are vegan or not, have been tested on animals at some point. This is the harsh reality, (and not often discussed). With regards to Botox injections, the great news is that pharmaceutical company Allergan, whose products include Botox and Juvederm (dermal fillers), have set out to eliminate animal testing by 95% in the next three years and are apparently making good headway with this. Are vegans allowed Botox injections? In my opinion it is a totally personal choice. Just like wether or not you love or hate Botox it’s a individual choice, as is the decision to be vegan or not. 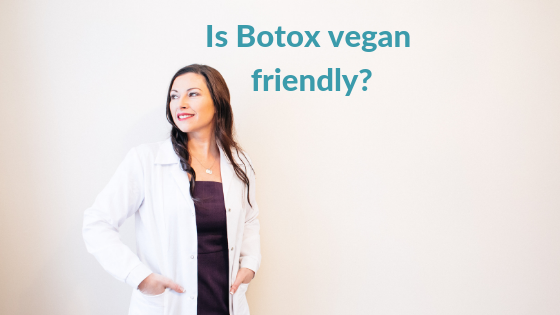 I have clients who are trying to be vegan for various reasons and I am curious to see if they will give up on their Botox injections following this blog post, time will tell. My thoughts are that they will be back to see me. Interesting subject hey? Which has got me thinking about alot more than just Botox injections!